ATLANTIC CITY, NJ - Atlantic City's Boardwalk Hall has received a double honor as it was recently named one of the top ten stops by leading trade publications Venues Today and Billboard for mid-yea rankings in the category of mid-sized arenas with 10,001-15,000 venue capacity. Both magazines are highly respected, prominent resources for key executives, artists, and promoters in the music and entertainment sectors. Venues Today, a source for sports and entertainment venue managers, based its rankings on concert and event grosses from October 16, 2012 through May 15, 2013. The SMG-managed Boardwalk Hall placed number six in North America and number ten in the world among their mid-year stops with a total box office gross of $5,196,251 for the events that were held in the building during that timeframe. Some of these events include Carrie Underwood’s "Blown Away" tour, Adrian Broner vs. Antonio DeMarco in the WBC Lightweight World Championship, The Who’s “Quadrophenia and More” tour, AHL hockey, “Operation Hat Trick”, a charity exhibition hockey for victims of Superstorm Sandy, and WWE’s “Road to Wrestlemania”. Billboard, an influential publication within the music business, has ranked Boardwalk Hall number two in North America and number nine in the world based on box office scores from November 1, 2012 through May 31, 2013. The total gross for that timeframe accounts for $6,010,587. Billboard has also announced the top 25 tours for the mid-year, including two Boardwalk Hall bookings, Carrie Underwood’s “Blown Away” tour and The Who’s “Quadrophenia and More” tour. Since 2003, Boardwalk Hall has received recognition on eight prior occasions from both Venues Today and Billboard magazines as either the top grossing mid-sized arena in North America or the world. Last year Boardwalk Hall was named the number two “Top Stop of the Decade” by Venues Today which was based on total box office gross from July 1, 2002 to June 31, 2012. SMG operates Boardwalk Hall and the Atlantic City Convention Center on behalf of its client, the Atlantic City Convention & Visitors Authority, a division of the New Jersey Casino Reinvestment Authority (CRDA). 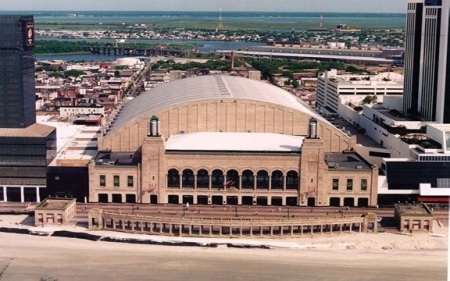 Boardwalk Hall was one of four SMG-managed buildings to rank in the Venues Today top ten stops for mid-sized arenas. The other three facilities include the Save Mart Center in Fresno, CA, the Van Andel Arena in Grand Rapids, MI, and the Intrust Bank Arena in Wichita, KS. Boardwalk Hall and the Van Andel Arena also both ranked within the top ten venues on Billboard’s list. SMG, through its corporate entertainment division and its Atlantic City-based management team, has positioned Boardwalk Hall as a prominent venue in the sports and entertainment market. For more information, visit www.boardwalkhall.com.